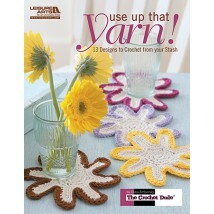 Crochet Uncut > Reviews > Book Reviews > Use Up That Yarn! This booklet is a collection of 13 projects designed especially to use up small amounts of leftover yarn. Whether you have just a few yards left of a skein or yarn that you just don’t know what to do with, you’ll find something here. Projects cover a wide range of patterns and include coasters, a tea cozy, bottle holder, cup cozy, bowl, neck warmer, fruit basket, table runner, wrist warmers, scarf & hat set, and scarf & mitten set. The smaller projects are perfect for those small skeins you just can’t bear to get rid of and all projects work up fast. I know I have some fuzzy yarns that have been sitting in my stash for years that would be perfect for the scarf, mittens, and hat!